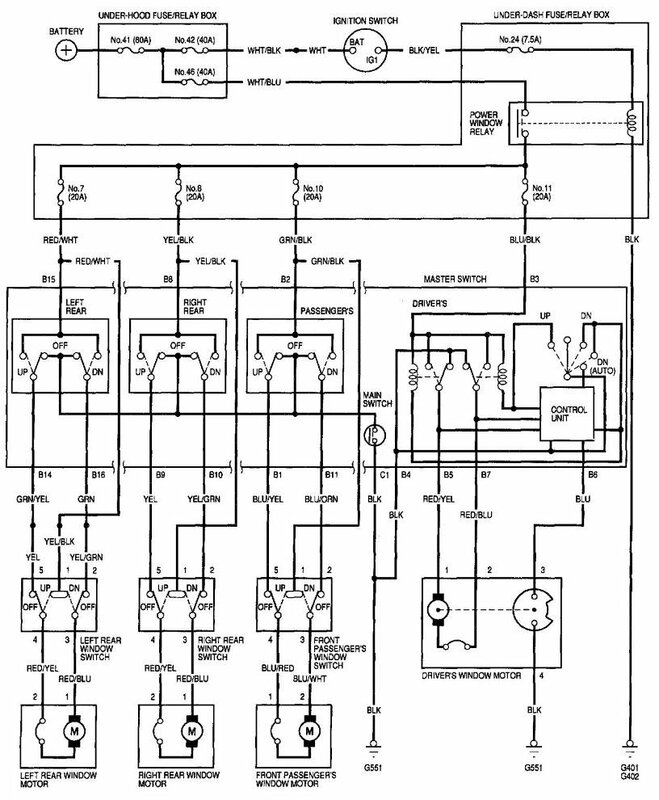 Anyone havea wiring diagram handy for a 1996 Honda Civic Si 5-Speed. My power windowsaren't working anymore. Both driver and passenger. I'm trying to figure out ifrelay, Master Switch, Window Motor, or kink in wiring is the cause. Somebody told me to use a paper clip orpliers to bypass the master switch. Anyone have a diagram to know which spotsto touch on connector for up/down. Don'twant to blow fuses or relays. I was told this is a good way to figure out thatthe switch is bad and relays are working!! if this gets either window to flinch, you have wires broken in the jamb. Very common on cars of that era now. I'd probably just peel the exposed covering off the door connector and look there anyway, see of there are some wires broke free of the connector. Opening door slowly nothing happened. I did voltage checks on the plug that goes to master switch. With key on there's only voltage coming from A1. With the window down pressed I get voltage on A8,A3,A4,A5,A12. Passenger window button on master switch didn't do nothing, just voltage on A1. I don't know where to proceed from here!! Ok, you're gonna need a wiring diagram. Each switch controls both a power AND a ground to run each motor, you're gonna have to check for both. Goooogle landed a diagram for a 4 door, probably similar to a 2 door? Is there an optimal tire/wheel size and offset? Font Style Used For "Integra Type R"